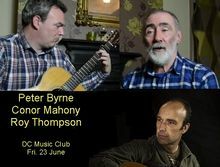 From Drimnagh in Dublin, Peter Byrne had been floating around the Dublin Folk scene since the early seventies, frequenting various music clubs, such as the Meeting Place, and Mother redcaps Tavern, where he, along with his wife Eilish Moore, ran a Folk Club every Saturday night for over ten years. Peter’s demeanor is that of a quiet, modest man who just loved listening to music and song, and would sing the odd song, when asked. However, the reaction to his voice and delivery of the song always enthralled the listeners. It was in later years, after his early retirement from CIE (where he worked for over forty years), that he met acclaimed Newbridge musician Conor Mahony, that something just clicked. Rehearsing every week on a regular basis, both of them realised there was something truly special. Conor Mahony has been playing classical guitar since childhood but is also equally fond of playing Traditional and Roots music. A singer and songwriter himself, his intricate delicate guitar arrangements are quite impressionistic and are tailored to perfectly enhance each song. The album contains mostly traditional songs and is entitled "Land and Sea". Beautifully produced and engineered by Frankie Lane, the music is a rich blend of tradition and innovation, both delicate and raw.